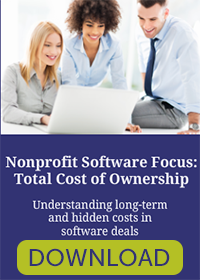 White Paper – Has Your Nonprofit Organization Outgrown its Small Business Accounting Software? 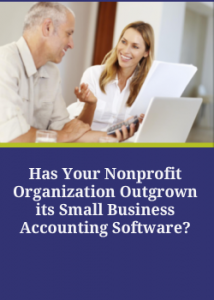 Has Your Nonprofit Organization Outgrown its Small Business Accounting Solution? This white paper explores the five signs your organization has outgrown its small business accounting solution and gives you some ideas on what you need to present a new solution to your board of directors. 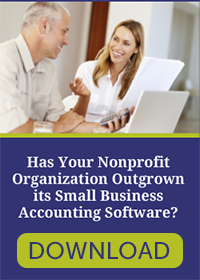 Small business accounting software does not address the need to assign expenses to program services, fundraising, or operations classification and cannot adequately label expenses. 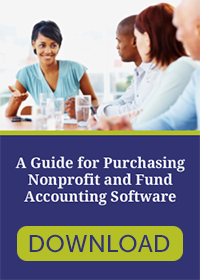 The ability to create reports for each of these areas are critical for nonprofits to remain compliant with the IRS, remain accountable with the board, and communicate with their major funding sources.